Giving Back | Hey Girlfriend! Wondering what to do and where to shop over the next weeks? Have no fear! Keira Seerose and her Chic Management Team have once again worked their magic and are about to open up yet another great event full of yummies for your shopping pleasure. Back to Black opens Saturday, February 11, 2012 and runs thru the 29th, thats over two weeks of shopping! The Back to Black event raises awareness of mental health issues, something that affects us all, one way or another. Each of the many participating designers have created a new, and sometimes exclusive item inspired by words of hope and courage. Read more about designers involved, as well as the event, at the Back to Black info page. There is sure to be something for everyone at Back to Black, here is just a peek at a few of my favorites. Take a moment now to plan your shopping, clean your inventories to make room for new stuffs, and fill those caffeine containers. Don’t forget to get your favorite viewer ready too, to enjoy the event with as little lag as possible. And now I’m off to take more photos…see you at Back to Black very soon!!! Event Organizer Keira Seerose has been at it again, and this time I suspect she’s outdone herself. Kiera puts together some fun shopping events, which also raise awareness, and give back to RL, of various RL issues. Her latest project, Culture Shock 2011 kicks off May 1, and will run thru May 22, 2011. Approximently 174 designers will be releasing new items, with a portion of their sales going to Médecins Sans Frontières (Doctors Without Borders). Miamai will be one of the participating designers, and will be releasing a few new items. One, is the Jojo top, which I love for its rich colors and flirtiness. I chose to wear it with my fave pants from Zaara for a dressy casual look, but it would be great with a skirt, jeans, or shorts too. Next, I wear the Keyla Mini Dress, also being released by Miamai at Culture Shock. It’s bright and colorful, perfect for those upcoming warm summer nights. Culture Shock starts Sunday, May 1, so get started now cleaning your inventory, scheduling some time on your calander, purchasing Lindens, or whatever else you need to do to go to this great and worthy event. It’s one you will not want to miss, I promise. The GLANCE Front Row 2011 RFL event runs thru the month of April, and is just too good to miss. It’s full of new, previously unreleased, and exclusive items from many of our favorite designers, and 100% of all sales goes to RFL. The first items to catch my eye are from JANE. JANE is an adorable shop which is owned by Janie Marlowe, formerly of Mischief. If you were a Mischief fan, you’ll love the new JANE, and if you are unfamiliar with Janie’s designs, you need to fix that now and get over there for she has many wearable dresses, sweaters and other goodies. With these exclusive new items for GLANCE Front Row’s RFL event, you’ve a perfect opportunity to go check JANE out and get some new dresses too. I chose the shirt option of one of the Lucidity dress to wear with a fave pair of Jeans from League. Poses shown are also exclusive GLANCE Front Row items, from Bent! You know you can never have enough poses, so head on over there and help RFL and get some new poses too. For more info on GLANCE and the 2011 Front Row event, read more about it at their website. Read more about RFL of SL at their official site and find more on giving back to RL thru SL. I am amazed by the RFL activities to be found in SL, and I am proud and honored to have been given the opportunity to be one of the official bloggers for GLANCE, so keep an eye out and I will try to get as many of these great offerings as my router, ISP and RL will allow. When RFL’s Fashion for Life opened a few days back, my first stop was Zaara. Always a favorite of mine, at RFL and anywhere else, I couldn’t wait to see what was in store and was delighted to find this fun dress I hadn’t yet bought, in a special edition color. I had to have it, not only did I get to help RFL, but I got a dress I’ve been wanting and in a special color too. It’s Win Win no matter how you look at it. Another specially colored item, is this favorite shirt from Zaara, which I already had in several shades, but I wasn’t about to miss this yummy new color. Another thing you wont want to miss…Elika hair in FFL Collection…12 colors to choose from, and in this particular style, you get two bang options, thats 24 hairs! I’m having so much fun trying some shades other then blacks. Another favorite, must go to store on my list, is Poetic Colors. They are participating in the FFL Hunt, going on at the FFL Sims. Participating stores have boxes “hidden” with items priced from 10L to 100L. Note my new specs, a newly released pair from Hatpins, one can never have enough glasses, even in SL. There is still lots of time left to get your shopping done at FFL. The lag is nearly non-existent this year, so with the crowds thinner now, it should be a perfect time to do some shopping. Make sure to switch on your stream too for some great music, which seems to be going on every time I’m there. Ok everyone in unison..scream…”It’s Pose Fair time!!! !” We’ve had fairs of all sorts but…wow..Pose Fair …how cool is that!!!? Everyone loves a pose, everyone uses a pose,…whether for just ..standing there (unless you are forever doing the Ruth) or whether you are a fashion photographer collecting every pose possible. 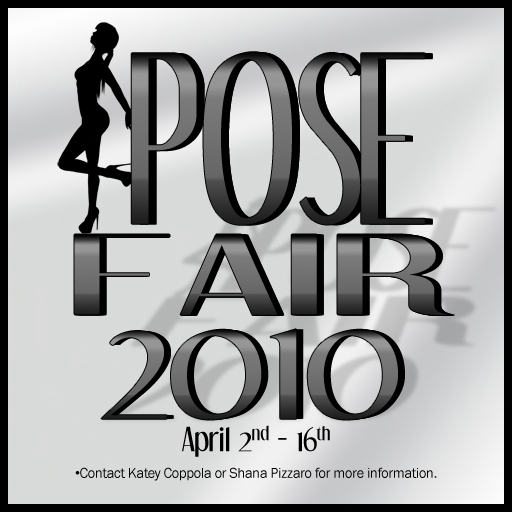 Pose Fair 2010 began (yes I am late…holidays and rl and more rl) April 2 and runs thru April 16. The lag wasn’t tooooo bad when I was there, but do dress down for the occasion, as always when visiting these events. There are also blue and pink skins available if you wish to really dress down and look like a pose ball person. You dont’ have much time left, so hurry on over there, time is nearly out, you’ll find approximately 100 pose vendors, more then enough to keep you shopping happy for an afternoon. If you would like a peek at some of the poses you’ll see there, visit the Flickr group to see some pics people have submitted using their purchases. The purpose of Pose Fair 2010 is not simply to bring us new and original poses by our favorite as well as new posemakers, but also to support Motivation. Each vendor has at least one pose set to give a percentage of its sale price to this organization that helps people with mobility disabities in low income areas all across the globe. You’ll find many fun, limited time poses you’ll not want to miss. Get on over there now…shop! Poses!! Time is running out, and you do NOT want to miss this, so..go..now..! Every year since my joining SL, RFL Clothing Fair has been a must do event, full of clothing designers all over the grid that have come together for this event to launch RFL. This years will prove to be no less an event I am sure. I was fortunate enough to receive early access to this years fair as a blogger, so I promptly snuck in and snapped a few sim shots, knowing I was short on time this week and wanting to get some before all the lag hit. I was completely awestruck at the build of the sims. Clothing Fair 2010, the 4th Annual event, benefiting Relay for Life, opens today, the 13th of March at 3PM SLT. It only runs thru the 21st, so don’t wait too long to get over there as you will not want to miss it. The build is incredible and breathtaking, with its nine sims of eight “Fashion Cities of the World” theme You can shop in Paris and London and then go to Rio. This years event involves 150 of SL’s best designers, each creating four, yes I said four! new items for donation to RFL. You do the math, that is an amazing amount of dedication and commitment to this event so be sure to visit all the stores and fill that inventory of yours. After Clothing Fair is over, make sure to visit their main stores too, and show your appreciation for what they have done for SL and RFL. A brief note on lag – All I am going to say at this time is..it’s SL, there are so many variables that go into your SL’ing experience, and it’s even more so at an event like this..so take a few moments before going to prepare yourself for visiting the worlds cities and to try to make it a positive experience. Shut down unneeded programs, adjust your graphic settings. Dress for “travel” to all the cities, a simple, comfy outfit and low prim hair and various other things. You’ll be sure to enjoy it so much more.